You might not think too much about the steering in your MINI, except for the fact that it's quick, precise and adds to the well known "fun factor." Just like the engine and other mechanical systems in the car, it needs some regular attention to operate at it's fullest capacity and to prevent problems down the road. This article will shed some light on that system which most directly connects the driver to the road. MINI uses a conventional hydraulic power steering rack, but instead of an engine-driven pump found in most cars, MINI utilizes a pump driven by an electric motor. This frees a few horsepower that would ordinarily be used to drive the pump and increases efficiency. The constant drag of the pump on the engine while at cruising speed comes at a time when the need for power assist is nearly nil. The electric pump has circuitry which is used to control or "modulate" the power drawn from the car's electrical system as well as control the hydraulic fluid flow according to the steering system demand. This allows the motor to run slower (and draw less power) when there is little or no need for assistance, such as when driving on straight roads or idling in traffic. When the driver turns the steering wheel, the control circuitry built into the pump's motor increases current flow to the motor, making it spin faster and subsequently moving more hydraulic oil through the steering rack at a higher pressure. Sharp turns and tight maneuvering such as city driving, parking and autocross events keep the motor/pump running in an elevated power state. Once the road straightens out, the system returns to a reduced power state to cool off, save power and increase component life. 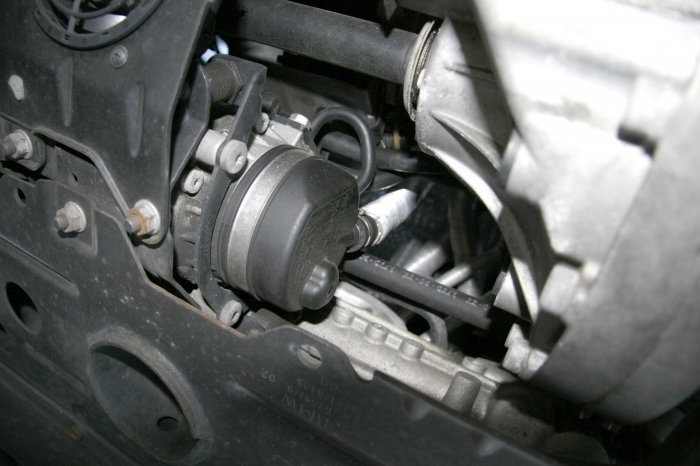 MINI owners and enthusiasts have complained about early failures of the power steering pump, often without warning. The failure mode is obvious, with no steering power assist on starting the car, or worse, a sudden disappearance of assist when driving. When power assist fails, steering is still possible, but with a greatly increased effort. If in the midst of a turn and the pump fails, the driver will find the car wanting to suddenly go straight ahead. Likewise, if the pump fails approaching a turn, it will feel as if the car will not turn. In either case, applying more effort to the steering wheel will keep you on course. However the effect can be very startling and can even cause an accident if the driver is unprepared or not paying attention. What can be done to increase the life of the electric pump and other parts of the steering system and what are the signs of possible impending failure? There are several actions that can be taken, even by those not the least mechanically inclined. The first place to check is the level of power steering fluid. This should be done any time one checks the engine oil. The MINI owner's manual does not even mention the power steering system as part of a fluid check regimen. The 1st gen MINI owner's guides did not even show the location and procedure for checking the fluid. 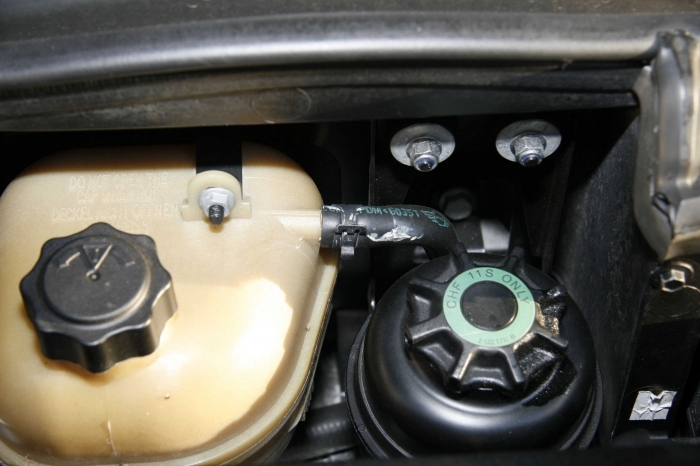 Viewed from the front of the car, the PS fluid reservoir is located to the right of the coolant overflow/reserve tank. Unscrew the black cap to remove it. Attached to the cap is a dipstick. Like checking engine oil, the power steering fluid should be between the lines. 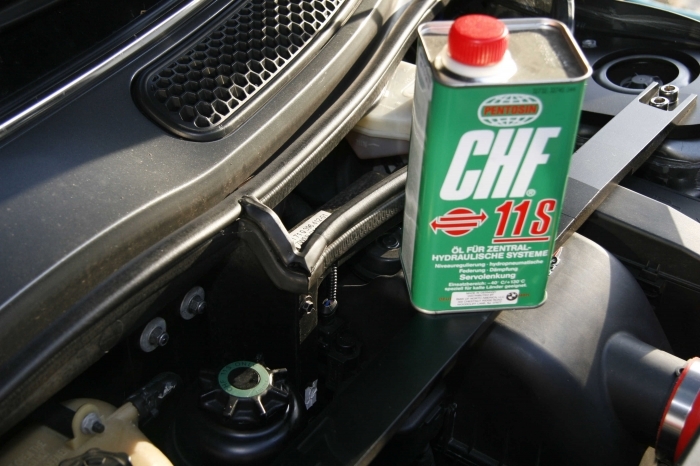 If low, add fluid using ONLY Pentosin Power Steering Fluid CHF-11S. Do not use conventional fluid, since the Pentosin oil is a synthetic light oil which the system is designed to use. Conventional fluid is thicker and more sensitive to temperature changes and will cause an increased load on the pump. 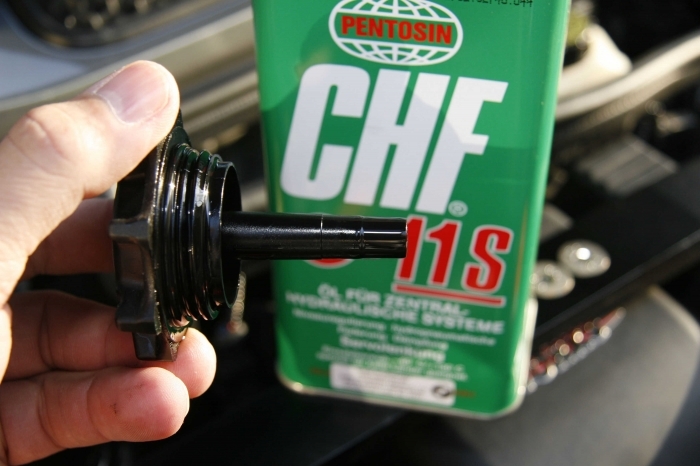 The Pentosin oil is available from MINI/BMW dealers and available in a 1 liter can. It costs about $30 USD. In normal use, there should be no loss of fluid. If the fluid is exceptionally low, check for leaks. Common areas of leakage are the hoses attached to the reservoir that run to the pump. 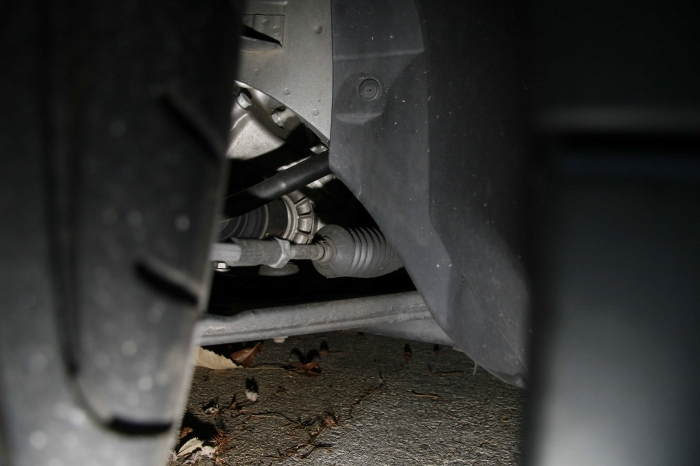 If there are no visible signs of oil leakage externally, the fluid often leaks into the steering rack tie rod boots. Caused by a seal failure in the power steering rack, this "hidden" leak causes the fluid to collect in the hollow flexible boot. This will sometimes cause the boot to appear to be sagging and there might be an oily stain where the boot meets the rack and/or the tie rod. Removal of the boot from the rack will confirm this. 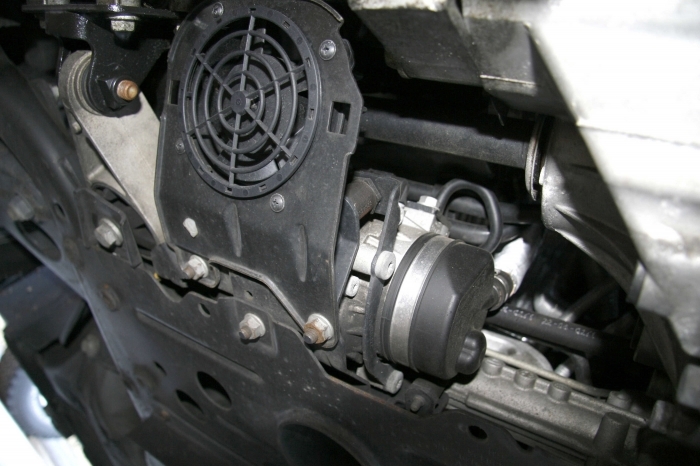 If fluid has collected inside either or both boots, the steering rack needs to be replaced. The PS pump operates with a sound unique to the MINI. Normally not heard above the engine sound, it becomes a noticeable whirr when the steering wheel is turned and the car is sitting still or idling at low speeds. A sign of potential failure is an increased noise level from the pump at all times. This is most often caused by low fluid levels or a leak that is causing air to enter the fluid, causing foaming. Foamy fluid creates an additional load on the pump as well as increased heat levels in the entire steering system, shortening pump life. Wheel alignment plays a big part in the longevity of the system. If the car has a tendency to pull to the right or left while driving in a straight line, this will cause a constant load on the pump, making it run at elevated power levels most of the time. If you must maintain more than the slightest tug on the steering wheel to keep the car on a straight track, have the alignment checked. Also, larger than stock wheels and tires create additional loads on the system, especially if the alignment is questionable. The tendency for the car to track irregularities in the pavement ("tramlining") due to tire types or bad alignment also will load down the system. Cars that are used in heavy city driving or high performance driving events have their steering systems maxed out more often than usual. The increased under hood temperatures coupled with minimal airflow under the car, as opposed to conditions caused by highway driving, creates a hotter environment for the motor/pump to operate in. A fan placed under the car in front of the pump/motor assembly is meant to keep temps in and around the pump from getting too hot. However, this fan is a very failure-prone part due to its design and often does not function properly. Also, the operation of this fan is not determined by the temperature of the motor/pump at all, but rather the heat load of engine. Basically this fan comes on any time the engine fan is run at high speed because of an increased need for cooling - operation in hot weather while using the a/c, for example - and the PS fan is turned on to help keep the extra hot air being blown over the engine and down through the hot exhaust from cooking the pump assembly. Check the condition of this fan any time you are performing maintenance on the car, such as when changing oil. With the key off, give the fan blade a spin. It should turn easily yet not freewheel. If it takes a great effort to turn the blade or there are noises heard while turning, the assembly has most likely gotten bound up by dirt and water and will need to be replaced. The process is simple. Remove of the two nuts holding the fan and bracket in place and disconnect the single electrical connector. Replacement is the opposite of removal. Total time needed is only about 5 minutes. 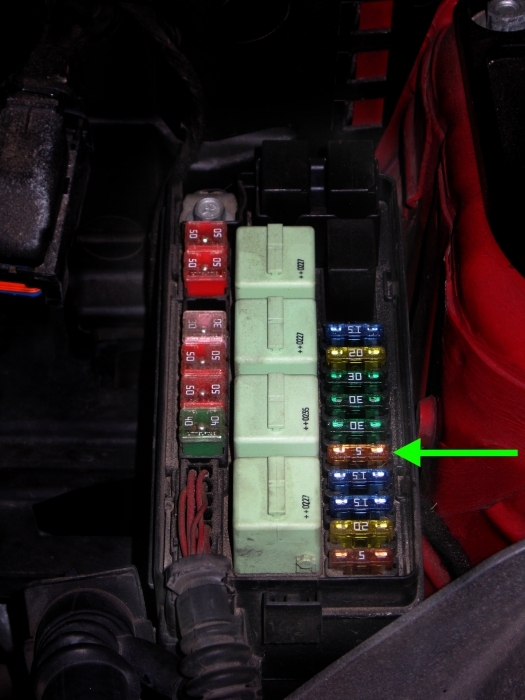 If the fan was found in a seized condition, check the condition of the fuse marked F5 in the under hood fuse box. This 5 amp fuse protects the circuitry that operates the PS fan, and in some early cars this circuit controls the engine radiator fan as well. If this fuse is blown, the radiator fan will not operate either. It is a good idea to check the condition of this fuse on a regular basis if your car is an '04 or earlier. The fuse for the pump motor itself is located underneath the fuse box. This 100 amp fuse rarely blows, but can be accessed by removing and inverting the fuse box and taking off a cover which hides this and three other high current fuses. These are bolted in place. So what can be done if you encounter a failure? There is, of course, the dealer. Expect to pay a lot for repairs, as the pump/motor itself is not cheap. 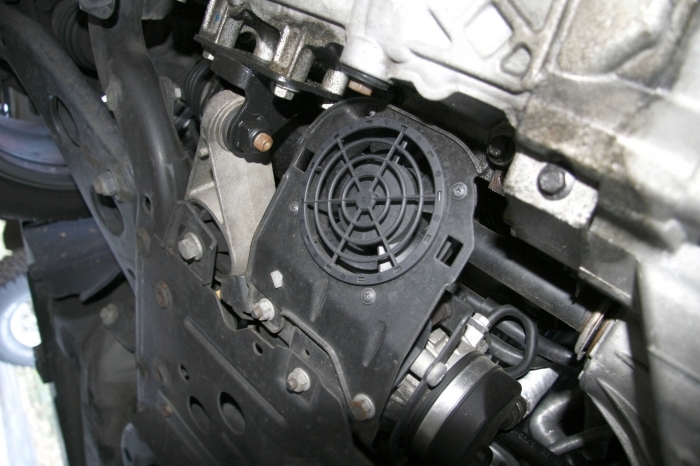 Replacement of the PS pump is doable by most skilled auto mechanics and knowledgeable DIYers. The Bentley repair manual for MINI covers replacement of the pump, steering rack and other ancillary components. This book is a great starting point for preventative maintenance and troubleshooting as well. If you notice any unusual operation of the steering system, be it noise, intermittent power steering boost loss, or leaking/loss of fluid, have these checked out immediately. In some cases, the longer one operates the vehicle under such conditions, the more expensive repairs can become. And if you take some steps like those outlined above, you might be able to prevent damage and the need for costly repairs in the future.